1,8 – 2,0 mm thick Waterproof, Hydrophobic and Breathable Leather. Waterproof and highly breathable GORETEX® layer Extended Comfort laminate. Abrasion resistant lining with optimised Climate comfort for higher activity levels and for changing indoor and outdoor use. Comfortable, well cushioned, moisture resistant and anti-bacterial insoles. Separate heel section for improved cushioning and enhanced fit. “AIRFLOW” channels help keep the foot cool, plus “Perfect-Fit“ marking to ensure correct fit. optimised tread pattern and special rubber compound. Flexible, Lightweight and completely metal free puncture resistant midsole. Lightweight and Athletic sole construction with a high level of slip and abrasion resistance, offering improved heel to toe control in all weather conditions. The lightweight PU cushioned sole provides optimum comfort as well as excellent thermal insulation. The non-marking rubber outsole is also resistant to heat, oil and gasoline. 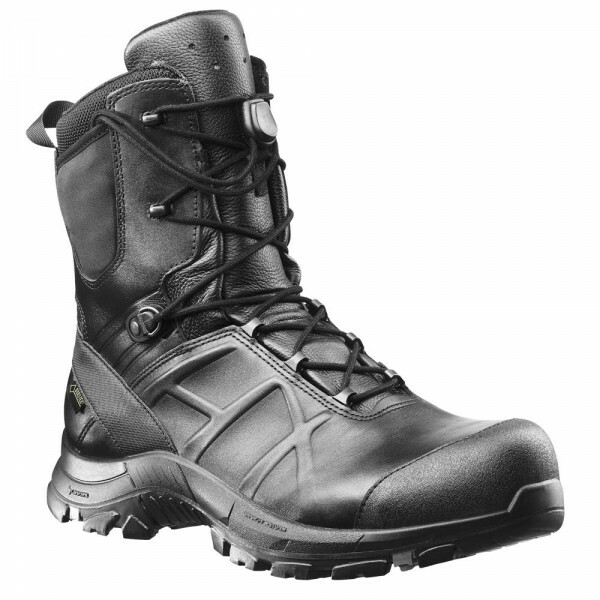 HAIX Climate system with Micro-Dry lining releases hot air through vent holes at the top of the boot, keeping the foot cool in all conditions. Two Zone Lacing System allows the wearer to ‘lock-off’ the fit on the bottom section of the boot, while adjusting the top section. Additional manually applied rubber ‘toebumper’ for improved durability, plus enhanced heel bend for improved flexibility and comfort.